I mentioned recently to my brother how a high school friend on FaceBook made a reference to a poem, and that I was quite surprised by how many of her FB friends worried about her v.s. recognizing the quote and the amusing application to her situation. We’d undoubtedly both memorized “Jabberwocky” because Dale and I grew up together, had many of the same teachers, and it’s such a fun and adventuresome poem which rolls around your tongue as you dramatically speak it aloud. Back to the conversation with my brother. He, too, remembered how I loved to memorize poems. I grinned on my end of the phone, recalling in my mind snips of lengthy ballads by great poets. Then he started quoting one I used to say: “Once there was an elephant who tried to use a telephant…” — one I’d learned in second grade! That’s the poem my brother remembered I’d memorized. Besides reading, speaking, and memorizing poems, there is also the writing end. Besides, I find poems to be rather subjective. Back in South Dakota, a couple decades ago, I created three very different poems, different both in styles and themes. I gave all three to three teachers I worked with and asked their opinions of which they liked best. At the time, I wanted to try to focus my poetry writing. When they got back to me, each had chosen a different poem she really, really liked, and responded “eh” to the other two. It turned out my experiment was more about subjectivity than poetry style or theme. I truly admire people who can write poetry. Truly. I just can’t do it myself. So, instead, I think I’ll go rummage through some of my dusty books and, alone in my house, dramatically read aloud a few choice favorites. Please feel free to do the same. HAPPY BIRTHDAY, U.S. NATIONAL PARK SERVICE! 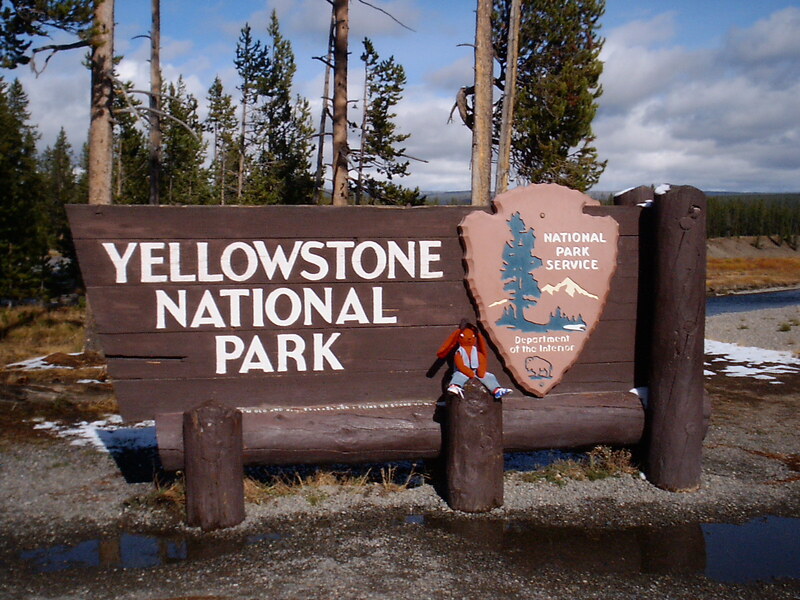 I took Stu Patterfoot to visit Yellowstone National Park. This was the first US National Park, signed by an Act by President Ulysses S. Grant in 1872. The park is mostly within the state of Wyoming, but also covers parts of Idaho and Montana. 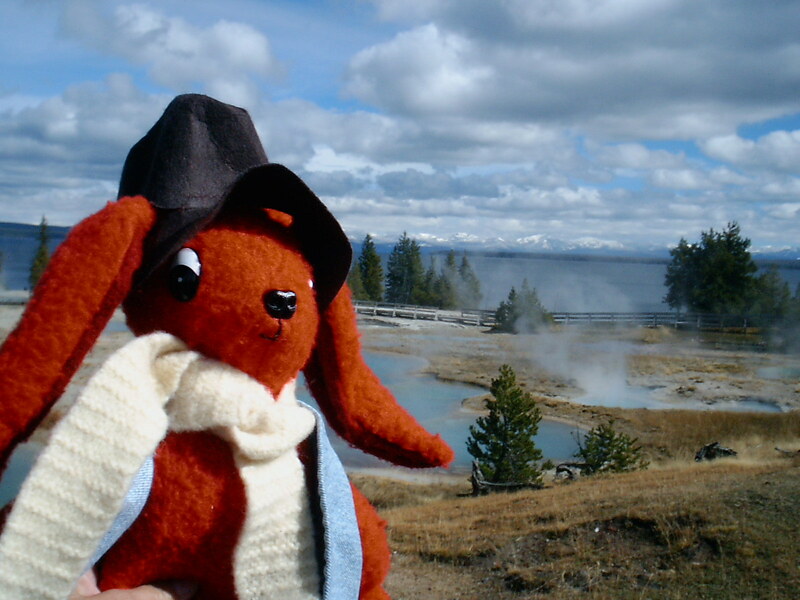 It displays many geothermal features, like Hot Springs and Old Faithful Geyser, which Stu is sitting in front of. Besides the unique land features, there is also an abundance of wildlife. This park, particularly is near and dear to me because long ago, between college semesters, I spent a summer in the park. I was a cabin maid at Mammoth Hot Springs. This was my first time seeing mountains up close, and took me nearly two weeks before I no longer felt like I was walking inside a picture. The entire summer was one wild adventure. Back then, there were a few times at work when my maid-partner and I waited inside a cleaned cabin to allow a bear or bear family to wander on past us before we deemed it safe enough to dash to the next cabin to clean. 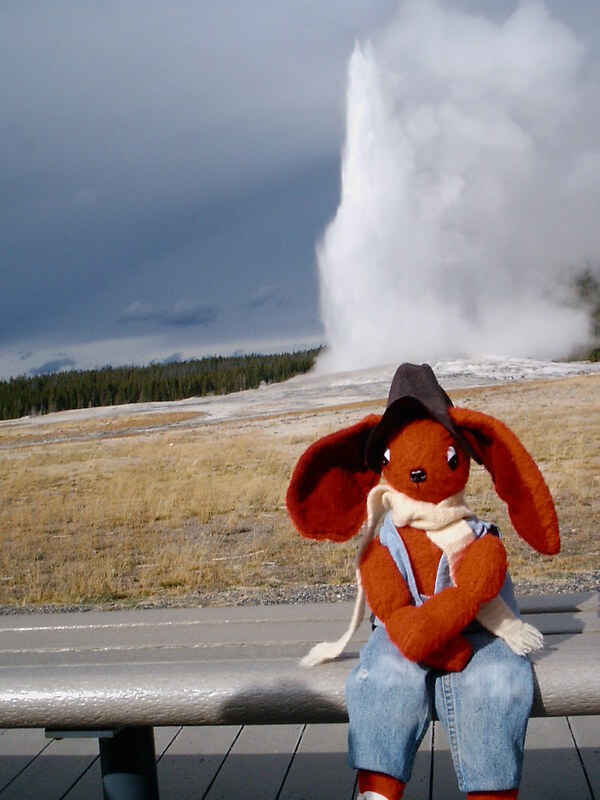 Although I haven’t added geothermal features to any of my stories (yet), nor bison or many of the hundreds of unique experiences or near-misses I experienced that summer working in Yellowstone, all my adventures are stored with many of them sneaking into my characters’ adventures. I strongly encourage you all to get out and experience nature, over and over again. The National Park Service has over 400 “units” to explore. (https://www.nps.gov/index.htm) This is our country. I’ll now return you to your regularly scheduled author writing posts. Keep on writing. During National Poetry Month (April), I decided to write a poem a month. MAN, has that been hard, and varied. First, it was all about the discipline. Then, it was all about the words. Then, it became about sound and creativity. But lately, I’ve come to the very interesting conclusion, that writing poetry doesn’t only make me word-aware, but it makes me frozen-in-a-moment aware, rather like a photograph. I’ll remember the time, the smell and sights and sounds, which surrounded me each moment I wrote one of these poems. At first I thought this goal of writing a poem a day during National Poetry Month was just another writing challenge. Then, I thought writing them was lofty, poetic, oh so literary. Then, I panicked, because I know I’m no poet and couldn’t tell good from bad. I can’t even rhyme. I craved to give up this challenge after the first few days. After all, I didn’t even have a Poetry Month Partner to encourage me along the rocky way. I’ve found writing poetry HARD. Writing good poetry takes talent. But if I fail in this challenge, then I fail as a writer. Why? Because if I am unable to pick my words well in short focused pieces, how can I choose my words well in larger works? Word detail is vital. Accent, tone, and each syllable is important. What an awareness! I’m thinking that every novelist needs to engage in poetry writing for a time. My Tools of the Poetry Trade: Usually I write with keyboard beneath my fingertips. But in this month-long experiment (well, only a week so far), I’m finding myself using pencil and paper more than any other time. I write down snatches of ideas for poems. I use the eraser a lot. Revisions take on an entirely new dimension. I also use a printed Thesaurus. I haven’t done that in decades. Lately, I’ve lazily depended upon computer-generated words. Soon, though, I may come to the thinking that even using a Thesaurus is lazy. The very interesting thing I’ve concluded now is that I’ve also found that writing poetry is FUN. There are so many venues. I’ve written sentimental pieces, silly ones from a child’s point of view, love songs, nature and gardening prose, couplets, snatches of ideas. The variety of possibilities is nearly endless, and best yet, I am not limited. I am no longer scared to try wordsmithing in verse. I’m thinking next time National Poetry Month rolls around, I may focus more, like write 30 limericks about nature. Surely, just for the sheer weight of my words, there will have to be one or two which is audience readable. Onward to engage in my poem of the day. So… I didn’t comment or read anything more. It was just too daunting for this writer. Maybe I’m just unique that it takes me L.O.N.G. to write out even the simplest response (like this), because it gets me thinking, because it stirs a response, because I want to word my response well. You see, I’d rather spend more of my valuable writing time actually writing or researching or revising or submitting than responding to posts. Sure, doing what Darcy says gets your name noticed, published or not, and I love her gumption and challenges, and marketing (getting your name out there) is definitely a related topic. Responding to her post here on my blog has taken writing thought time. Off to write a poem and revise some more. Today starts National Poetry Month. Therefore, my April Challenge to anyone willing to accept it, is to write one poem a day all month long. Okay, here’s my problem: I’m a horrid poet, and know it. I can’t even tell the Longfellow joke right. Sure, I own a few books of poetry and even a couple rhyming books, but, yikes! A poem a day! Who is crazy enough to accept such a challenge? Wait, wait! Aren’t couplets considered poetry? Why, yes, Sandy, they are. Even kids could write two sentences which end with a rhyme each day. What about songs? They are merely poems under another jacket cover. Okay, I’ll get my creative juices going, accept my own challenge, and see how disciplined I am to see how many poems I get written this month. Who knows? I may even be inspired to write more than just a couplet a day. The Farmer’s Almanac let me know that April comes from the Latin word aperio, meaning “to open or bud,” because plants begin to grow this month. Perhaps… just perhaps some poet will begin to bud this month as well. Good luck to all you poet challenge accepters.